In the previous article we have seen that why software testing is required. Now it’s important to understand the procedures and objectives of software testing and finding proper bugs in application. We can start testing with verify and validate procedure. For that we need to know about the Verification and Validation. Definition of verification is, to verify that a product which will be delivered to the client is built as per requirement or not. All non-technical meeting have been conducted in verification procedure. Now let’s come to the validation, validation means after compiling the application it must give expected result as per user’s requirement. 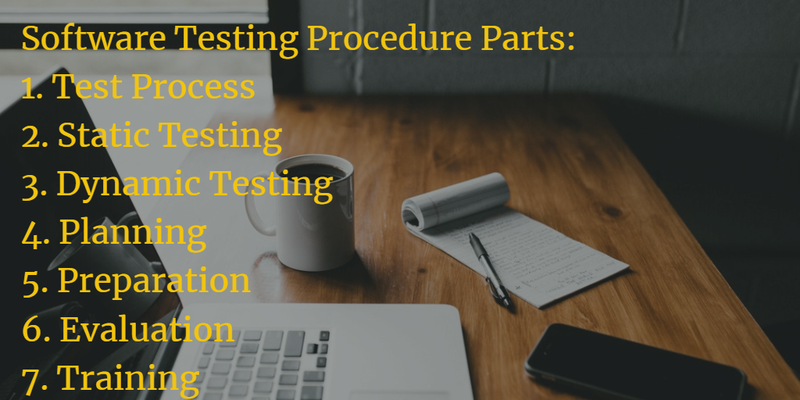 All functional testing can be done in this procedure. We will understand in brief in further articles. We can break the definition of software testing. It is not single activity, well define process is the best practice of software testing. That is the only reason, Testing procedure got placed in software development life cycle. If earliest testing procedure have been started in development of an application then bug count can be reduced. For that we need to do test design. Test design is part of verification. Test document is play major role in software testing. All the documents for requirements, planning, and test design can be managed in testing procedure. Thus, In future if anybody wants to get idea about the application then they can easily go through the documents and test cases which can give brief that how many work have been already done on this application and how much is left further. We will discuss the format for Test Plan and Test cases document. Next step in software testing is Static Testing. This testing type is came under verification process. Thus, here we need to test application without any code. For example, review of the documents, status meetings for application development, walkthrough, inspection etc. This all procedure will be done in static testing. We can say that analysis part can be covered in this section. Walkthrough means a non-formal meeting. In this, thought process can be shared within team members. But Inspection is formal meeting. In that all the documents are reviewed with peers and finalize all the procedures for develop an application and management purpose is satisfied. Product examination and defect tracking procedure also take place here. Defect report and follow ups for same will be discussed in this meeting between Software team. Dynamic testing is the further procedure in software testing. Here code testing is come to the picture. Code execution will be done for our application and accordingly pass and fail test cases can be marked by testers which give the perfect idea that how much our application is stable. Validation procedure needs to be done here. Unit testing, System Testing, Integration testing can be done here. Unit testing can be done by developer team before giving the build to tester team. System testing can be done for verifying the behavior of application on particular machine and device. As per requirement, System testing can be done. Integration testing can be done between 2 component and parts of any application. We will learn testing types in upcoming articles. After completing a round of testing, if number of fail test cases have more count than pass test cases then it indicates that we need to pay attention in development. A bug must be posted in bug tracking system for each fail test cases. This all procedure can be reviewed by team. Next step is planning. In this, we need to plan our testing activity like when to start testing, when to complete first round, how to send report and how to control all procedure. If issues are solved simultaneously then how can we manage this situation? With this planning, we can identify the status of testing procedure and further progress of testing can be figure out accordingly. To achieve our plan, we must go with preparation. Test cases for the application should be written in advance. Before release came, test cases should be written from requirement documents. Thus, as soon as release will be delivered to the testing team, work can be started with basic test case verification. Now main question is when to stop testing procedure. This can be identified with evaluation. In Evaluation, we need to verify test results and calculate the term that how can we complete the testing procedure and how long it will take to complete it and when all test cases will be passed. And Last step is, provide the training document to the client for application which help end user. This material is important as end user can get easy idea about the product.